Paula Bowles studied illlustration at Falmouth College of Arts. She now lives in Bristol, where she has worked as an illustrator for over 10 years. She is currently working on books with Nosy Crow and Simon & Schuster. 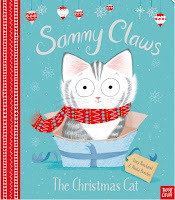 'Sammy Claws The Christmas Cat' (mine and Paula's first picture book together) was published by Nosy Crow this year. I am delighted that Paula has agreed to share some of her illustration wisdom with us and answer a few questions today. Paula, welcome to the Picture Book Den! 1) We love hearing about people’s paths into publishing. You’ve worked as an illustrator for over 10 years now. Can you tell us a bit about your journey? So, I went back to my drawing board and developed a portfolio of watercolour children’s book work, then I visited the Bologna book fair in 2007, and met Mark Mills (who worked at Meadowside publisher at the time). 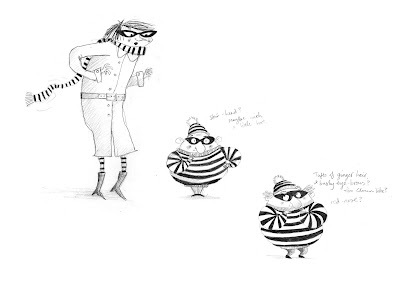 He then set up an agency called Plum Pudding Illustration and asked if I wanted to join; I said yes and am still represented by them 11 years later! Mark, and now Hannah, have supported and helped me to develop my portfolio during that time, which has now changed considerably since working for many years in watercolour. My taste developed over time in to something different, until watercolour didn’t quite do what I wanted to express. So, once again, I developed a new portfolio. This time, whilst retaining a pencil and paper feel, I use digital media which allows me to play with bright punchy colours; this is how I work now and I’m the happiest I’ve ever been! 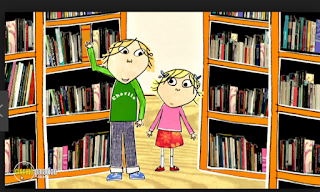 2) You’ve had experience of writing and illustrating your own books as well as illustrating texts by other authors. Which projects do you generally prefer to work on? It’s hard to say which I prefer, I like doing both for different reasons! I really enjoy illustrating my own stories; I like the process of ‘discovering’ the story in a sketchbook, with words and pictures appearing together. But working on other authors stories is a dream too, because their writing is so different to mine, their stories are fresh and exciting. I feel I learn a lot from illustrating for other authors, and draw things I might not normally choose to draw! It’s also fun to have another person in the mix to celebrate and collaborate with when the book is published! 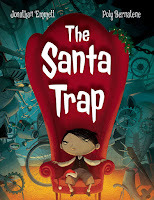 3) If you are collaborating on a book, what is it about a text that makes you want to illustrate it? 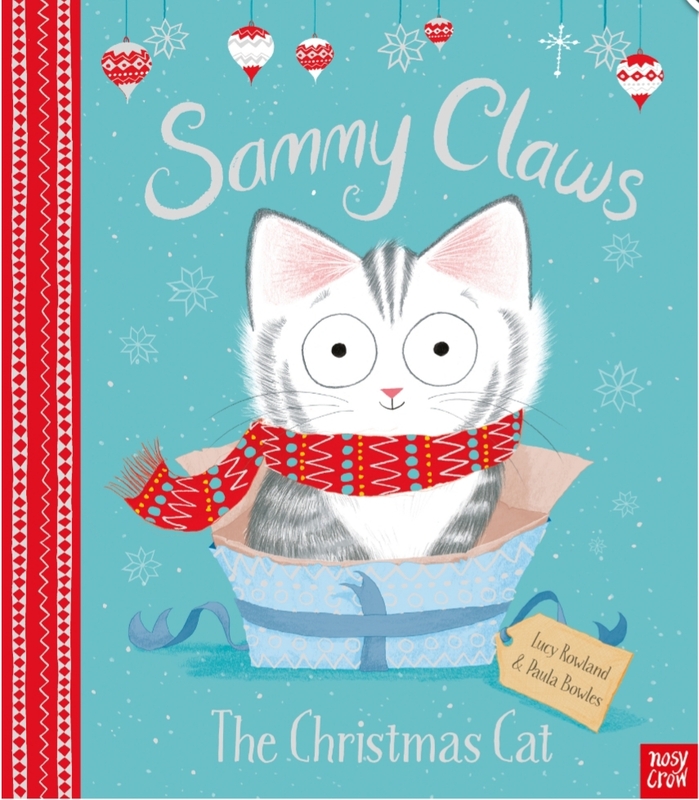 Was there anything in particular about ‘Sammy Claws, The Christmas Cat’ that made you want to take it on? 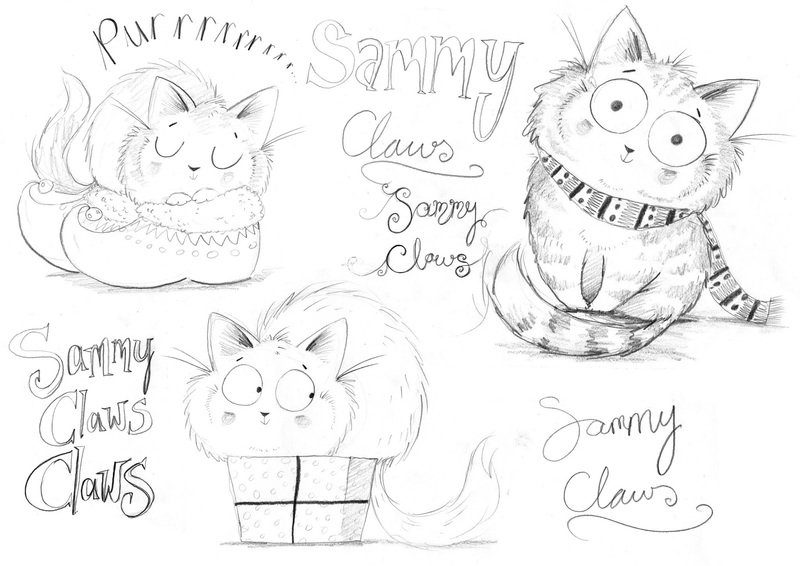 4) In the lead up to Christmas, you’ve been sharing all the different spreads from Sammy Claws. Which was your favourite spread to work on? Which is your favourite now? And were there any that you found particularly difficult? I think my favourite spread to work on was Spread 10, “Now, at a big castle (somewhere south of France)”. I like the composition flowing from left to right across the roof, all the snowy rooftops and turrets, as well as drawing all the different reindeer characters (I imagined Rudolph to be like a dog ‘pointing’, always alert and looking out for his boss, Santa, who I liked to imagine climbing the tall chimneys with climbing equipment!). 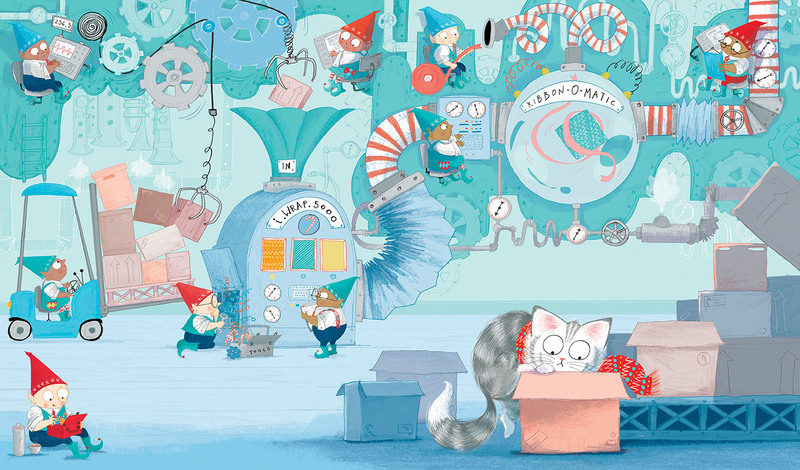 I think that’s still my favourite spread, although it’s a close contender with Spread 4, the elves workshop, which was also probably the trickiest spread to do because of all the detail! Those elves took a long time to do, but they are good fun and I loved inventing the wrapping machine - the ‘i.WRAP.5000’! 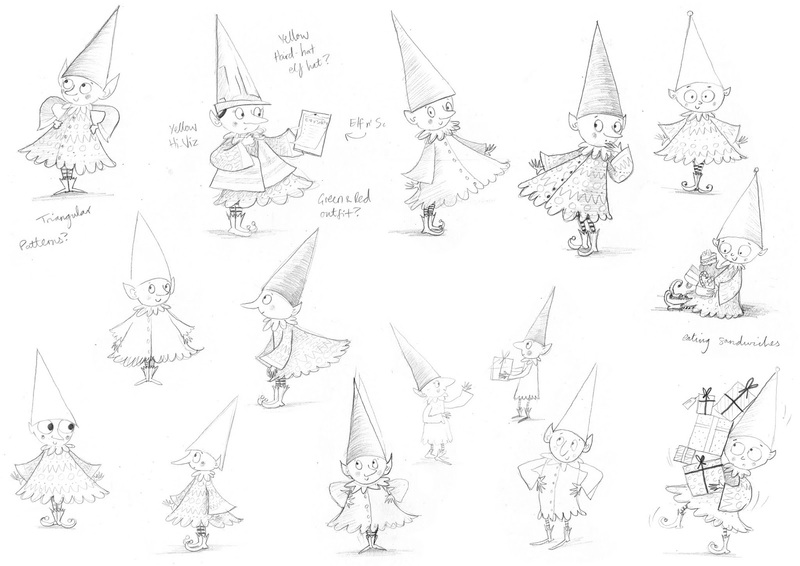 5) How you approach designing your characters? Do you read the text and automatically have an idea of what they look like or is there lots of trial and error? 6) Could you tell us a bit about your typical working day as an illustrator? I work from a shared studio which is a 30 min walk from my home. I usually arrive at the studio about 9.30am, make a cup of tea and settle down, answer emails, make a to-do list for the day, and catch up with my studio buddies. Then I put my headphones on and work until lunch, when I might pop out to the shops or, recently, I’ve joined ‘Borrowmydoggy.com’ so I might go and borrow a local dog for a lunch time walk! I usually stay at the studio until about 6 or 7, or later if there’s a deadline! Lately I’ve been working at least one day of the weekend too..because there’s just so much to get done… deadlines!! I definitely need to learn to take more breaks. 7) What is your top tip for budding illustrators who want to break into the publishing industry? Keep drawing and developing your work! Keep visiting bookshops and seeing what’s new and learn about the area of publishing you are interested in. Share and show your work with friends, and to publishing people - no one will know you exist unless you show your work/contact publishers/agents/network. You will need patience, persistence and passion. 8) What is next on the horizon for you? 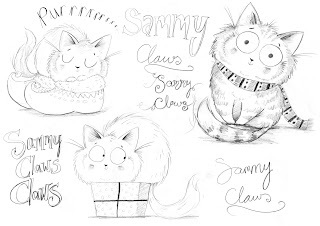 I have a picture book called Superkitty being published with Simon & Schuster in Febuary 2019, written by my agent Hannah Whitty! And I’m currently working on my second book with Lucy Rowland and Nosy Crow, as well as my second book with Simon & Schuster. 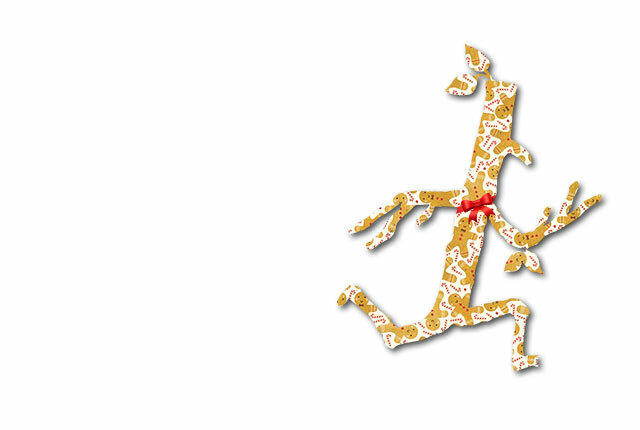 Mince pie or Christmas pudding? Cracker jokes or Cracker hats? Cracker jokes.. love bad jokes! Lazy Christmas morning lie-in or ‘up and opening presents at 6 am’? When I was a child I would be up at 5am! Now I’m a lazy so-and-so and enjoy a lie in. 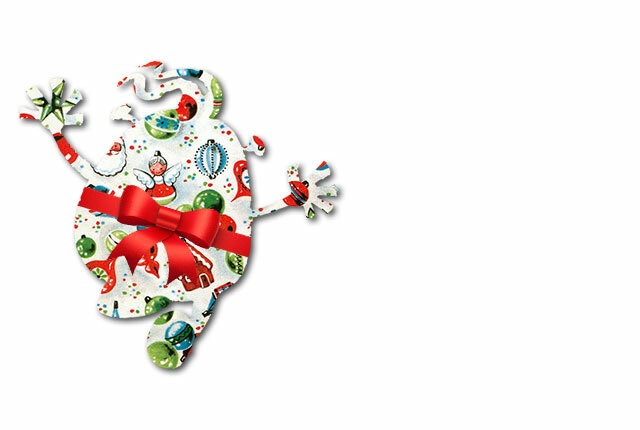 Lots of little presents or one VERY BIG one? 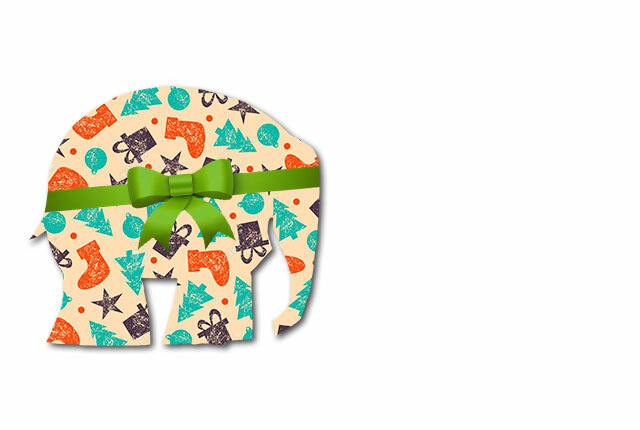 I prefer to give just one or two meaningful presents. To celebrate the festivities, here's our choice of picture books that involve food, served with Seasons' Greetings from all of us at the Picture Book Den and wishing a very Happy New Year to all! The Very Hungry Caterpillar can be used to talk about metamorphosis, and about greed, of course - but at this time of year - wouldn’t it be great to eat everything you want, and turn into something exquisitely beautiful?! 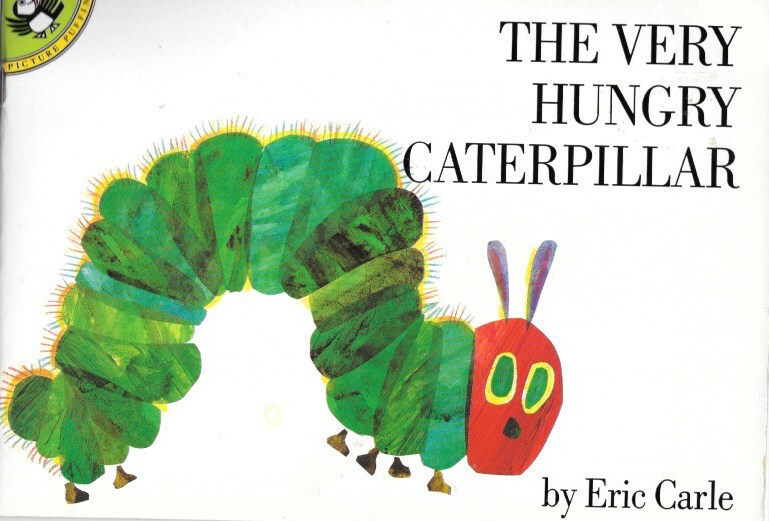 I'm not sure I ever learnt much about portion control from this book but I loved it all the same. There is even an embarrassing video of me reading it to my little sister somewhere. My choice of book to read this festive season, is from China. Although it's a bit early for Chinese New Year, it's a great story that's told in many cultures from Europe to Africa to Asia. It evokes memories of festivities, colour and feasts. 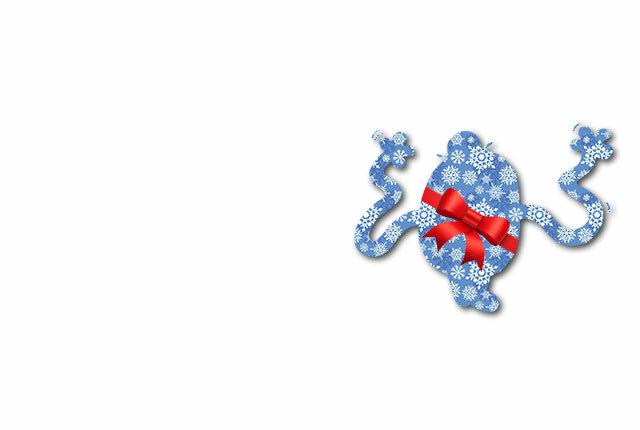 Enjoy the holiday season! 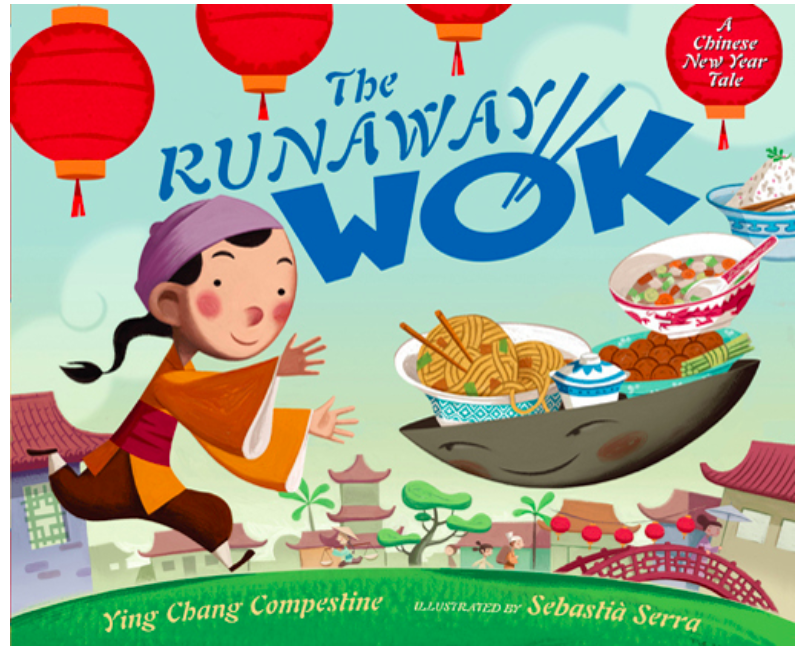 Written by Ying Chang Compestine, it's beautifully illustrated by Sebastia Serra. 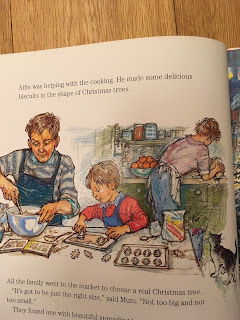 I nominate Shirley Hughes' 'Alfie's Christmas'. Because it shows the cosy chaotic sort of Christmas I am familiar with. And it is the preparing of the food that is at least as much fun as the eating of it. 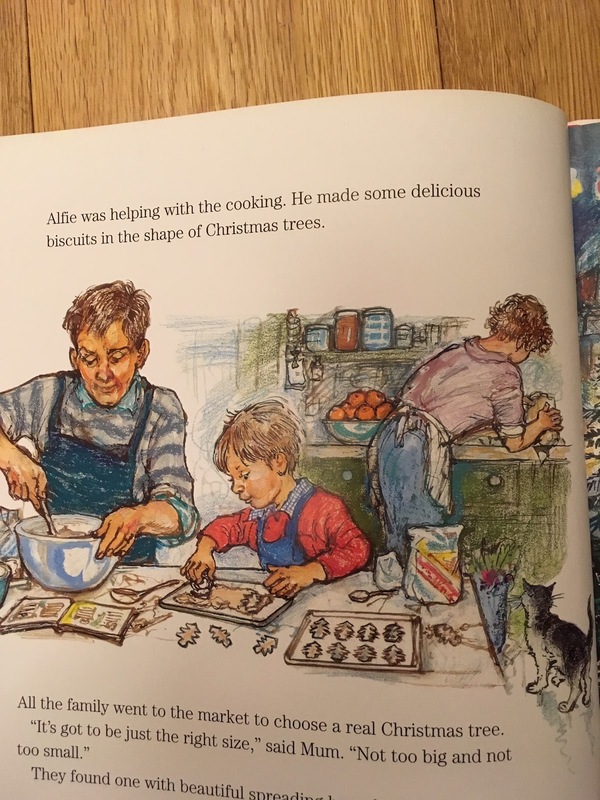 Look at Dad and Alfie mixing what it tells them to in a recipe book, and then carefully cutting out Christmas tree shapes that we just know are going to be iced with silver baubles stuck on like Christmas tree lights. See Mum doing the messy job of stuffing the turkey whilst the cat looks on with longing! This book makes me smile every time. I came across it accidentally at the library and was so enamoured by Sid, a clever cat who manages to scoff down six delicious dinners in one day! More that this, though, I love the sense of community in the story. 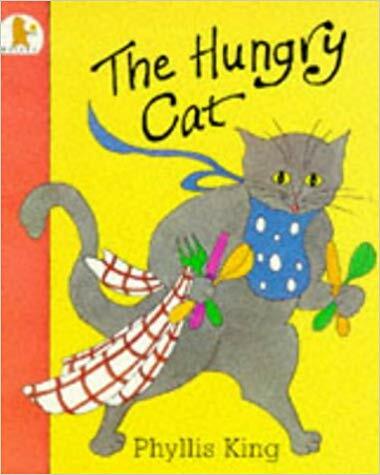 In this second adventure, when the six families on his street all decide to go on holiday at the same time, who will feed Sid? A cattery would not accommodate six dinners! So, Sid goes on the train to the Scottish Highlands, where the families have rented six cabins. He soon feels right at home - and, after an exciting day exploring and meeting the local wildlife, Sid is happy he has six or maybe even seven dinners to come home to! 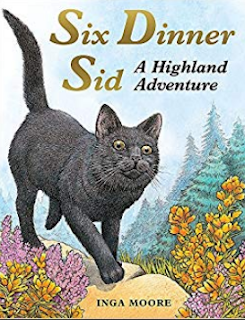 Sid's first adventure, Six Dinner Sid was a Smarties Award winner and features in the Daily Telegraph's top 50 children's books of all time. I've chosen "The Tea Party in the Woods" by Akiko Miyakoshi. On a winter's day, Kikko rushes out of the house into the snow to chase after her father who has forgotten a pie he was meant to deliver to her grandmother. In her haste to follow him through the woods, Kikko stumbles and accidentally crushes Grandma's pie and then, by some strange circumstance, ends up being a guest in a house full of clothed animals. The spread that really excites me is the tea party at the long table with Kikko sitting at the head of the table looking a little shocked by the company. 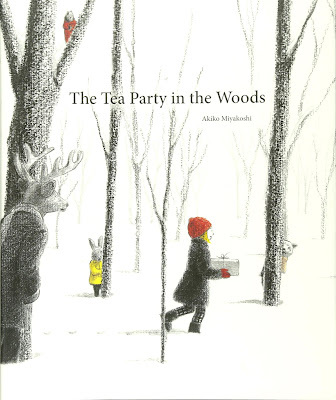 I love the mysterious feel of this book and the raw quality of the drawing. The animals then contribute slices from various flans and tarts at the table to replace the pie that got ruined and Kikko continues on her way to Grandma. This is definitely a feast I'd like to be a guest at! 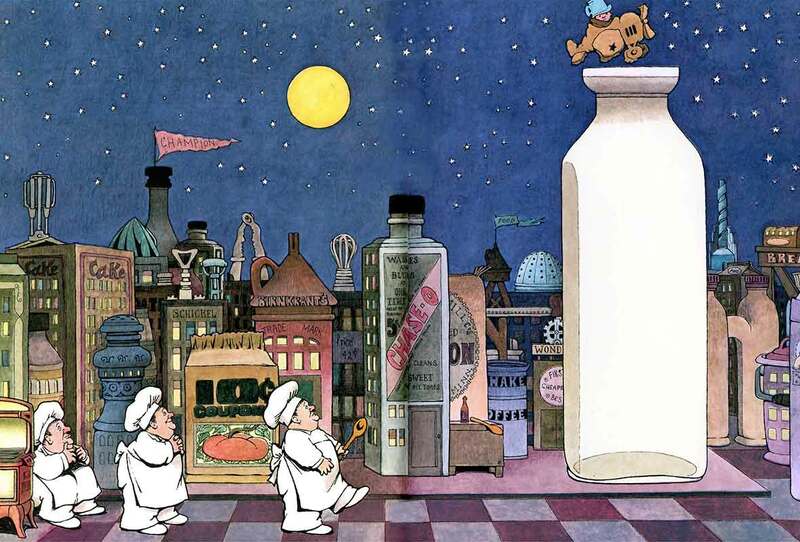 My favourite food-themed picture book is In the Night Kitchen by Maurice Sendak. There are many picture books about dreams but, for me, this is the only one that come close to capturing the surreal, irrational, incongruous quality of a genuine dream – and it's beautifully illustrated to boot! After being awoken by a mysterious noise in the night, Mickey falls through his bedroom floor into The Night Kitchen, a city-like landscape make up of giant packets, cartons and bottles. 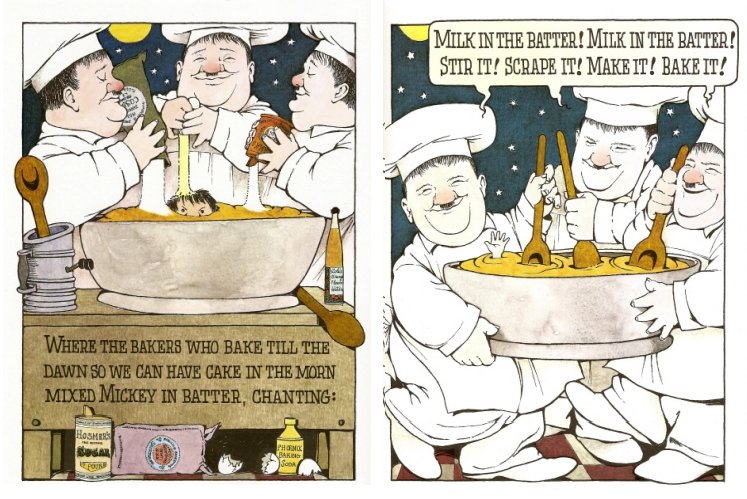 There he meets three bakers (all of whom look like Oliver Hardy) who, with authentic dream-like logic, mistake Mickey for milk and proceed to mix him into the enormous cake they are baking. Mickey eventually saves the day, the cake and himself by fashioning an aeroplane out of cake batter (I told you this was a surreal book) and flying off to fetch some actual milk. This time I simply can't resist including one of my old books, No More Biscuits! 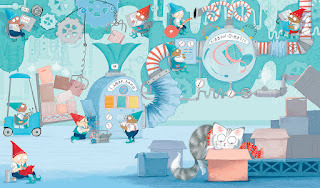 In the story, Florence eats all the biscuits, though she says Arnold ate some too (he's a toy monkey, but as we know, soft toys often get the blame for things). Florence tries to persuade Mum to give her just one more biscuit, but Mum is holding strong. It's a battle of wills, as used to happen in our house. The story ends with a compromise and they all make delicious 'Magic Monkey Bananas'. If only world problems could be solved with frozen bananas covered in chocolate and sprinkles. Wishing everyone a peaceful and joyous 2019. 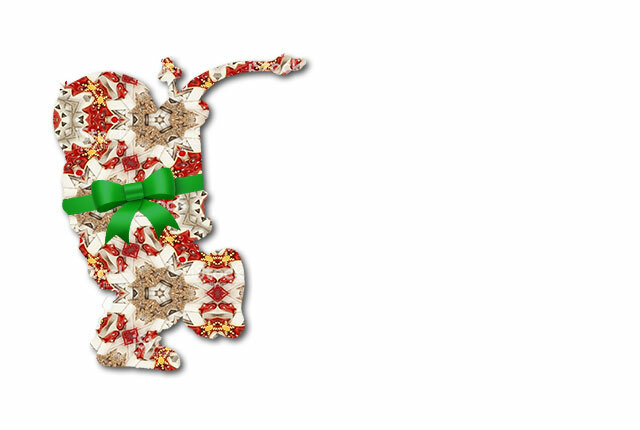 When I was a child, part of the excitement of the run-up to Christmas was shaking, squeezing and even sniffing the gift-wrapped presents beneath our Christmas tree in an attempt to deduce what was inside. 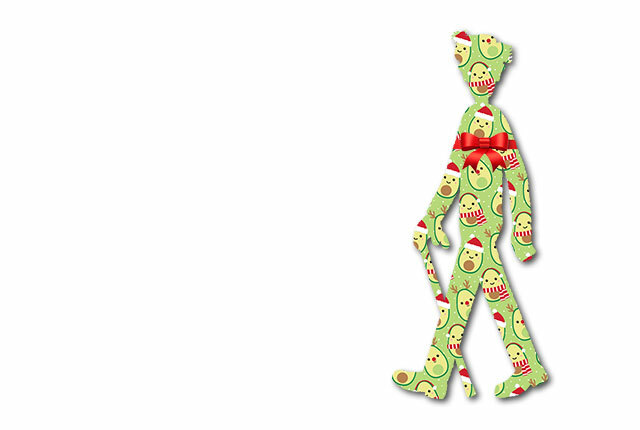 For this year's Christmas quiz, I've gift-wrapped 10 picture book characters. Since shaking, squeezing and sniffing are not options, you'll have to work out who they are from their outlines alone. How many can you identify? 10 All present and correct: Your picture book character recognition skills are exemplary! 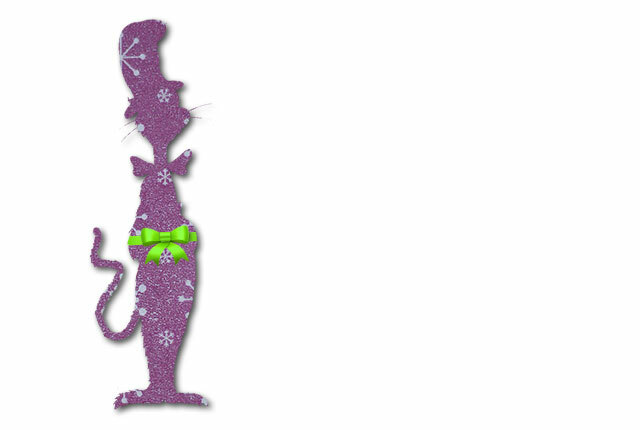 7–9 Gifted: You know your Seuss from your Scheffler. 4–6 Some contents missing: Not bad, but perhaps you should add a few picture book classics to your Christmas list. 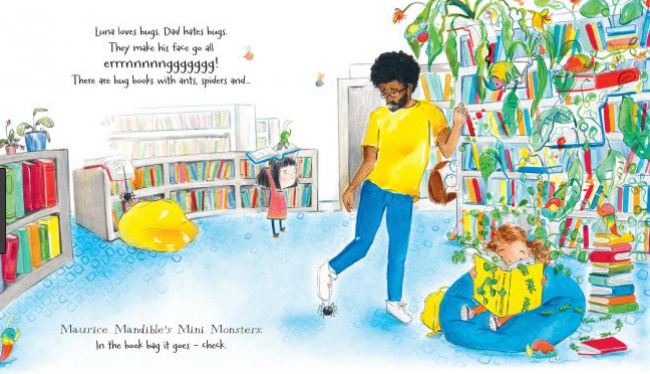 1–3 A bad wrap: You need to brush up on your picture book knowledge. After five years writing for Picture Book Den, this is my last post as a Den member (although I may return for the occasional guest post). I've enjoyed being part of the team, but it's time for me to move on and focus on other commitments. Thanks to everyone at the Den for their support and friendship over the last few years and thanks to all the Den readers that have shared or commented on my posts. 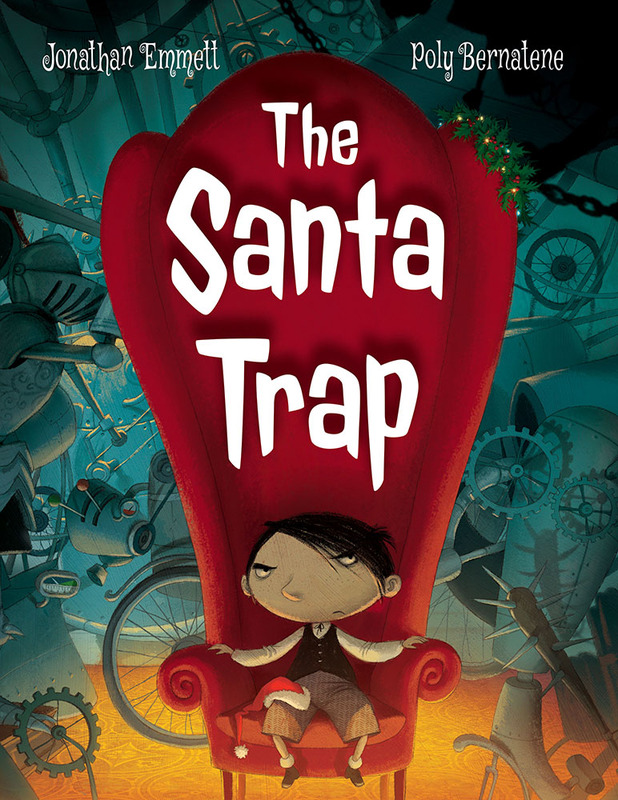 Jonathan Emmett's delightfully dark Christmas picture book The Santa Trap, illustrated by Poly Bernatene, is available in a UK paperback print-on-demand edition from Hatchling Books and a US Hardback edition from Peachtree Publishers. 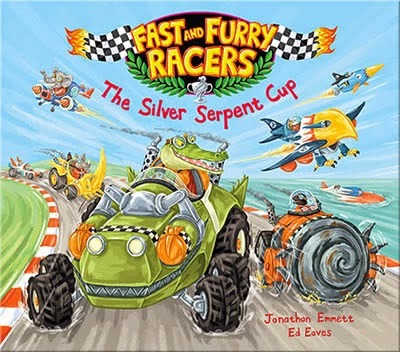 Find out more about Jonathan and his books at his Scribble Street web site or his blog. 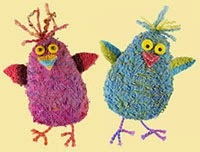 You can also follow Jonathan on Facebook and Twitter @scribblestreet. 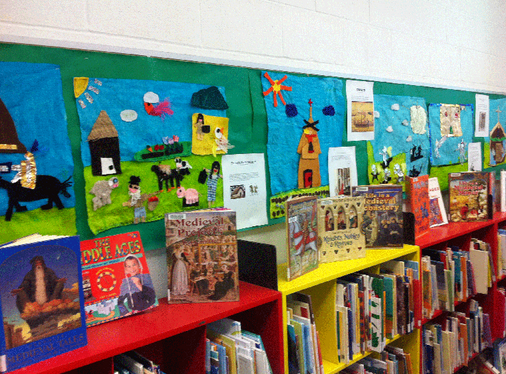 See all of Jonathan's posts for Picture Book Den. 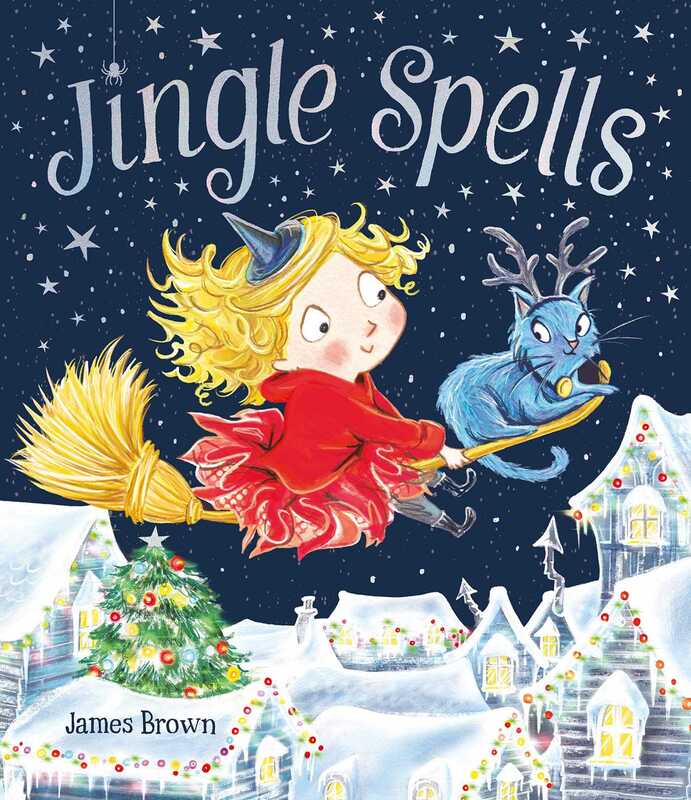 Bookshops are currently bright with selections of wonderful children’s Christmas books. Many of those books are picture books, and nearly all are books with pictures. There’s a brief but intense selling window for such books, and competition for sales is stiff. 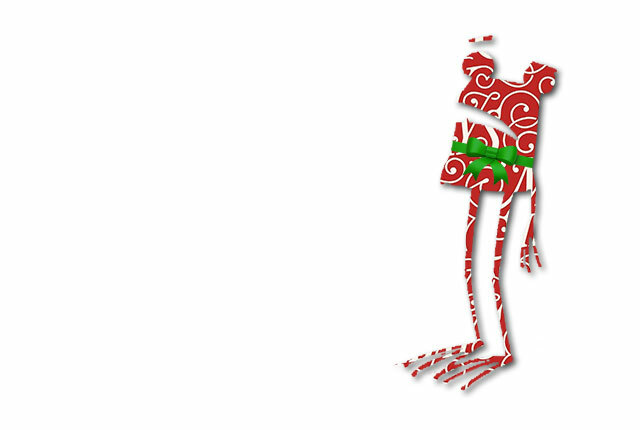 We all know some key trigger children’s book character and story types which have appeal – unicorns, diggers, monsters, fairies, dinosaurs, underpants, witches, fluffy bunnies and more – and now some of those characters have crossed what used to be an invisible boundary into Christmas. 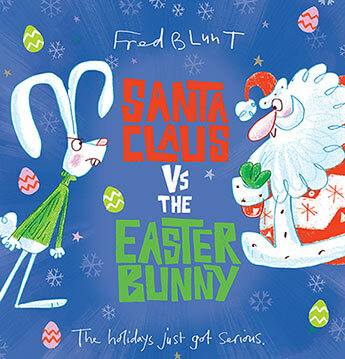 Fred Blunt pairs the Easter Bunny with Father Christmas, mixing originally religious festivals which have become more general to society. Easter Bunny is furious that Santa Claus has elves to do all the work of making the presents he gives whilst Bunny has to make the chocolate eggs himself. 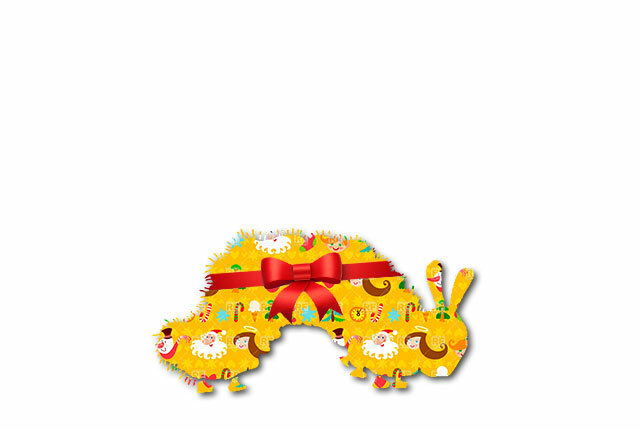 So Easter Bunny hatches a dastardly plan …. But of course it all ends in a funnily big-hearted way. 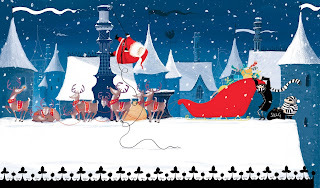 So I had to think of a story that didn’t have Winnie flying with Santa on his sleigh. 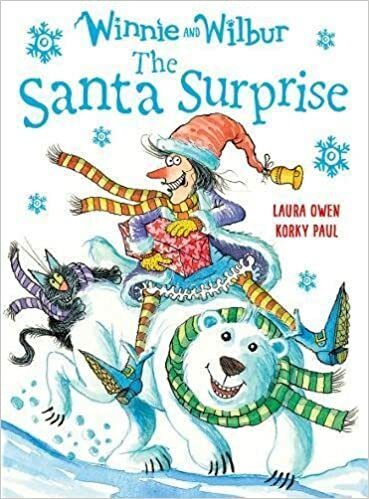 In my story (written under the fake name of Laura Owen), Winnie suddenly realises that if Santa delivers presents to everybody, there will still be one person still left out; Santa himself. That’s not fair! 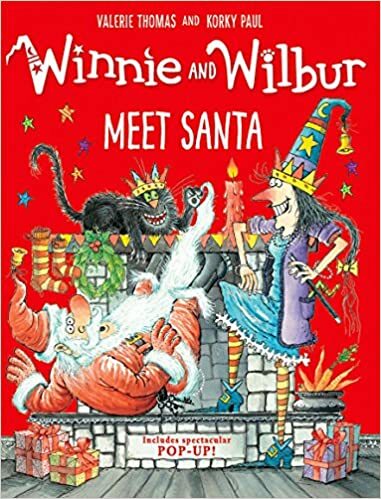 So in this Santa Surprise story Winnie and Wilbur try to deliver a Christmas surprise to Santa, with inevitable daft disasters that culminate in success of a kind they hadn’t thought of. Korky Paul has turned it all into a wonderfully wild and whacky visual story, showing that ‘picture books’ can overlap with chapter books. 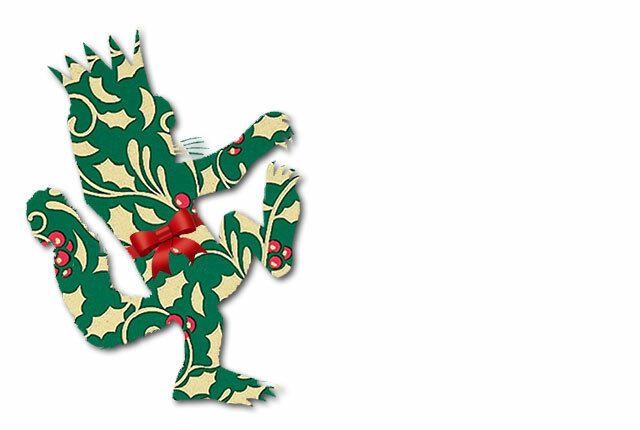 So, what would you like to see mashed-up with Christmas on the bookshelves next year? I have been thinking about libraries. Libraries are of course buildings that house stacks of books, periodicals, newspapers, computers – they are places that house INFORMATION in all its modern guises. If you’re lucky, they also have kind and knowledgeable librarians, who will give you advice and order books for you. They might also be really, good listeners! 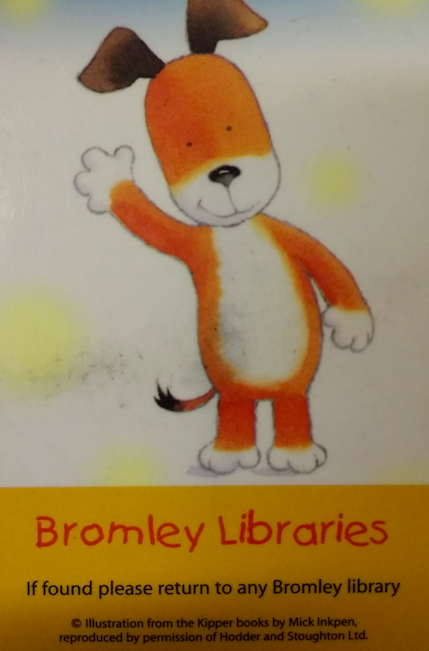 From A Library Book For Bear by Bonnie Becker - such a friendly librarian! 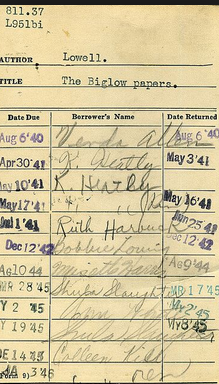 My relationship with libraries was habit-forming from the outset. I can still remember the books I chose and read from our lower school library. 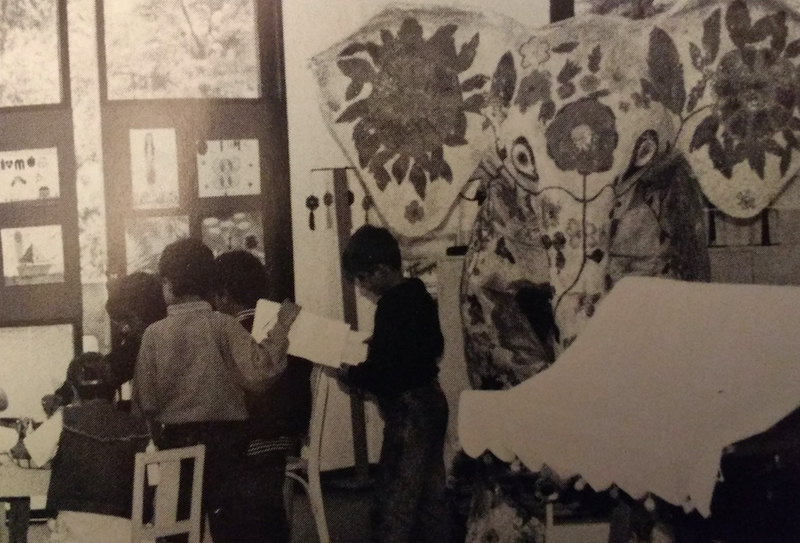 In its reading corner, it had a huge, spectacular colourful papier-mâché elephant that gazed down kindly over our small selves. You could sit underneath it and chat or read. It was a friendly welcoming presence and a really good listener. This was the place you could go and browse the open stacks to find the next treasure to read, do research for your school work, and where you could meet your friends at break or lunchtime. It felt like home because it had books and I loved books like friends. 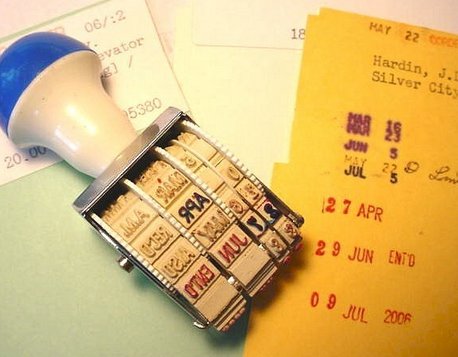 In those pre-computer, pre-barcode days, remember how your library books each had a card that got stamped in and out with an inkpad? It seems incredibly old-fashioned now compared to the cool automated systems available now! 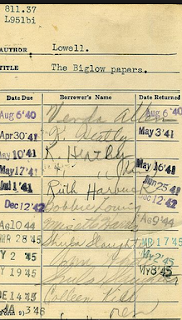 In high school, I often hung out at the library during lunch break and the librarian frequently had to tell me off for sneaking bites of my sandwich (“No eating in the library!") or laughing too loudly with my friends. At university and in my early days working as a children’s book editor, the library was essential for inspiration, research and fact-checking. I was lucky enough to visit the British Library in its old reading room in the British Museum and pore over the stacks at the London Library. Now, you can do a lot of this research from your desktop, but still, archives have to be housed somewhere, in a building, in a library. 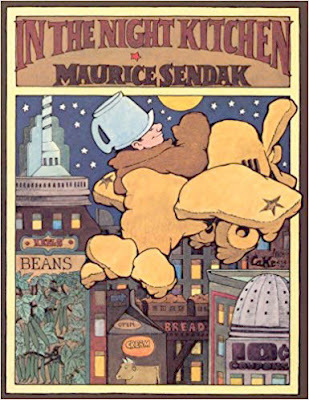 Recently for my book THE CRAYON MAN, I found it priceless to be able to research remotely using sources such as the online Library of Congress. 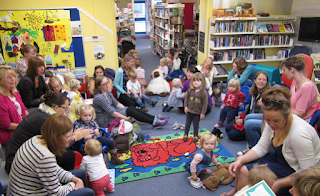 When I became a parent, our local library became the weekly destination for the sing and rhyme session. I re-learned all those nursery rhymes I’d forgotten, key for developing early literacy, and a looked forward to the respite of seeing other parents and toddlers. Now my son is older, going to the library has become a habit we can share – a regular trip to explore its shelves yields a pile of books to explore. We have a golden ticket! We have nothing to lose. It’s free (well, paid for by our council tax), and if the book is not the right fit, we can exchange it for another. In my life, libraries are first and foremost a place that has a truly priceless treasure – books I didn’t know I even needed to read! 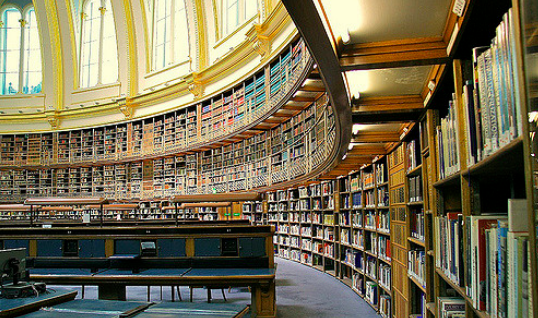 Libraries are one of the oldest institutions of our society, but in many places in Britain, they are in trouble. 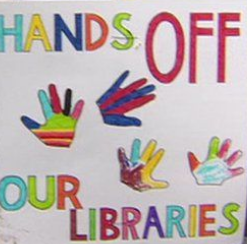 As funding is cut, many councils are either closing libraries or local volunteers are being drafted in to run them. In the case of the council where I live, the library is now run by a charitable social enterprise. The library is actually quite good still and we're incredibly lucky to have it within walking distance. 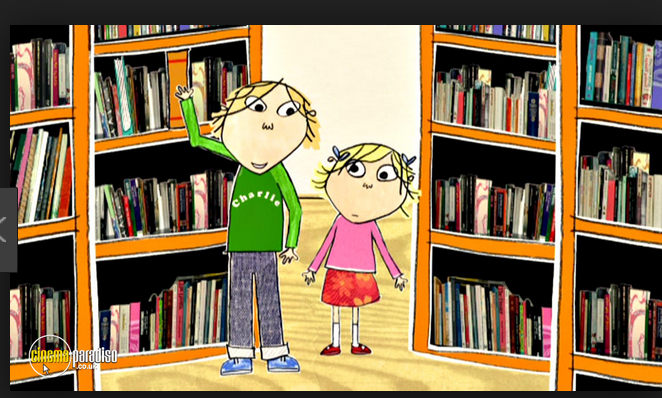 • 68% of 5-10 year olds and 74% 11-15 year olds visited the library in the last year. It was also found that “libraries play a key role in providing books for children”. Interestingly, research by the Arts Council also showed evidence of “library users having higher life satisfaction, happiness and sense of purpose in life”. Library usage therefore goes beyond books and reading, but also impacts on mental health, social inclusion, community and increased well-being. Reading books holds the key to our future, to creating imaginative solution-driven children, developing all-important empathy, and creating a happier, more equitable, diverse and peaceful world. And libraries, after all contain books – and books are friends! 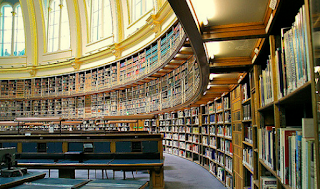 How have libraries shaped you? Natascha is the author of The Crayon Man (March 2019), Elephants Never Forget and Is This My Nose?, editor of numerous award-winning children’s books, and Co-Regional Advisor (Co-Chair) of SCBWI British Isles. 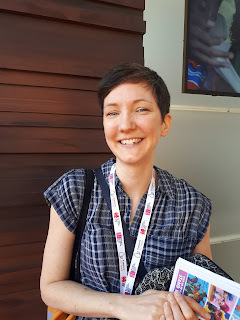 She runs Blue Elephant Storyshaping, an editing, coaching and mentoring service aimed at empowering writers and illustrators to fine-tune their work pre-submission. Check out her Cook Up a Picture Book courses!